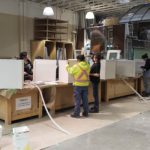 I often post stories and pictures about our apprentices here at the Finishing Trades institute of BC, extolling the good work they do as they learn a trade. However, I was particularly struck by the initiative shown recently by one of our painting apprentices and DC 38 member, Steve McBride. Steve, having seen the work performed by our apprentices from all four of the crafts we teach here, had an idea about taking the of skills his fellow apprentices, combined with the tools, materials and instruction supplied by the FTI, and turning all of that toward a project with a higher purpose. Steve thought why not take some of the structures that our apprentices construct and turn them into portable, temporary housing units for the homeless. This is not as far fetched an idea as you might think. There was a story a couple of years ago where individuals in the state of Oregon had come up with a similar idea building small structures which had proved effective in providing shelter to homeless people in that community. 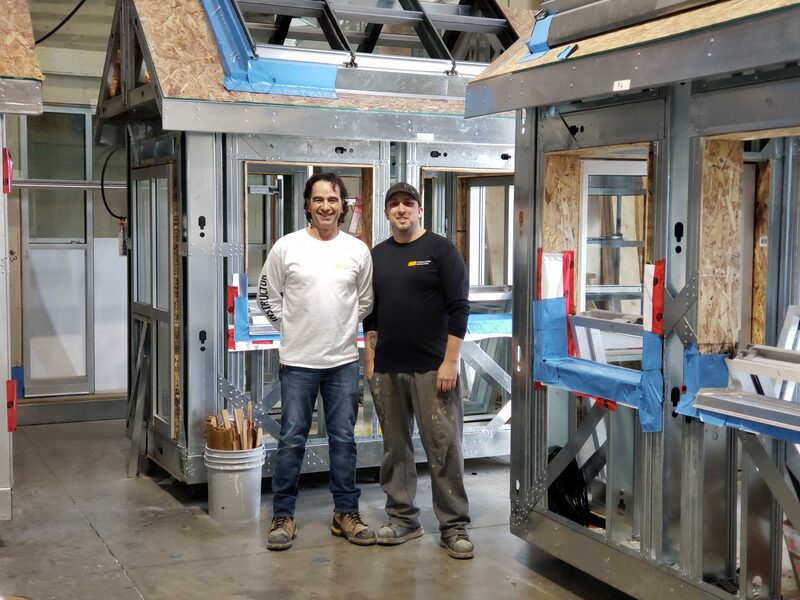 When you take a look at the picture at the top of this story you can see that with a little imagination and some additional work and design change, our mock-ups do look like small homes. Steve thought, wouldn’t it make sense to build these projects with a positive purpose in mind rather than building practice projects that would eventually be sent out to be recycled or worse, scrapped. Rather than keep this idea to himself, Steve decided to share those thoughts in an email he sent to the Premier of the province of British Columbia. To Steve’s surprise not only did he receive a response from the Premier’s office but from several high ranking bureaucrats including the Executive Director of Governance, Engagement and Corporate Services Branch of the Ministry of Advanced Education, Skills and Training. Where Steve’s idea will go has yet to be seen but you have to admire his initiative and his obvious love and respect for the work all of us do here at the FTI of BC. There is one little caveat I must add to this story however. While we appreciate Steve’s enthusiasm and initiative, we really would appreciate it if our students would share those thoughts with us prior to contacting persons in government or other outside agencies. Steve has a great idea but we’d like the chance to discuss the cost and time commitments involved in a special project or idea such as this. That way we at least we will know how to respond. Keep up the the good work Steve and please………. keep us in the loop. 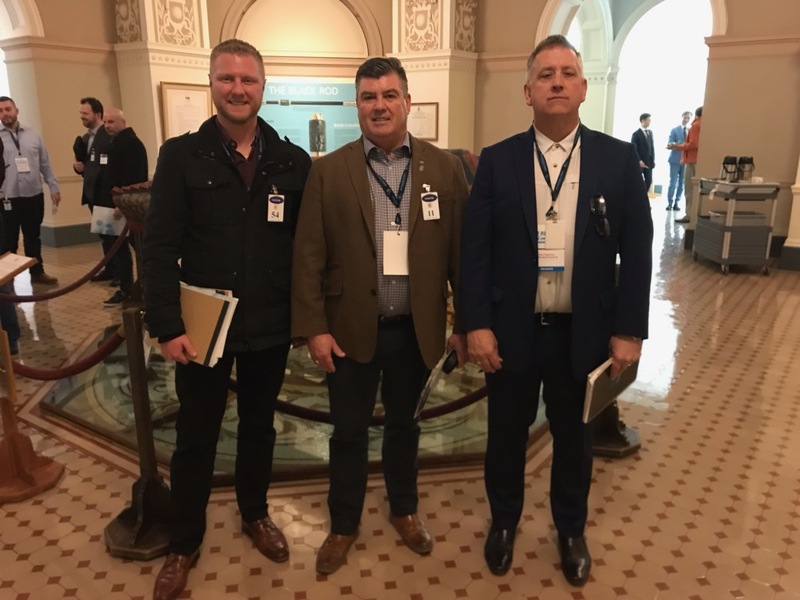 At the recently concluded BC Building Trades Conference held in Victoria, representatives of District Council 38 and the Finishing Trades Institute of BC had the opportunity to speak with the three main Provincial parties about changes needed in the BC construction industry. The four main topics of discussion revolved around, Community Benefit Agreements, changes to the Labour Code and Employment Standards, Apprenticeship Training and Compulsory Trades and finally, the Underground Economy. BC Building Trades Unions support Community Benefit Agreements (CBA’s) on several fronts. First of all, they ensure a fair bidding process where contractors, both union and non-union, have an equal ability to bid on publicly funded projects, knowing in advance what the bidding conditions are. 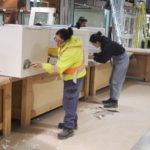 CBA’s also have quotas for apprentices set at 25%, as well as provisions for women and First Nations people to participate on these projects, ensuring that a made in BC workforce is given first crack at these jobs. 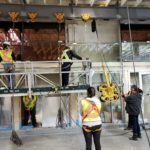 Building Trades Unions are also looking for changes to the Labour Code recognizing construction as a unique industry requiring language that specifically addresses those differences. Every other province in Canada has special construction industry language in their code, so why not BC? There is also a major issue with funding for the Labour Relations Board (LRB) as well as the Employment Standards Branch (ESB). In 2004 the LRB had their budget slashed by the provincial Liberal government by 46%, affecting staffing levels, thus allowing unfair labour practices by employers to grow exponentially. The LRB and the ESB received 0% in funding increases over the term of the Liberals time in office, allowing workers to be exploited by unscrupulous employers. We also spoke to the MLA’s about reintroduction of Compulsory Certification of construction trades. BC is the only province in Canada without such a requirement. Many people in this province are unaware that when Gordon Campbell and the Liberals eliminated Compulsory Certification, as a favour to some of their main financial contributors, they eliminated any form of consumer protection with regard to who is qualified to call themselves a tradesperson. Would you trust a doctor who didn’t attend university or a lawyer without a law degree? Anyone in this province with a pick up truck and a tool belt can call themselves a tradesperson in any trade they wish. Why would anyone attend trade school for four years when there is no longer the need? It all boils down to consumer protection and without Compulsory Certification, consumers have little to no recourse with shoddy and in some cases dangerous workmanship. Finally, we spoke to the politicians about the need to address the underground or “Cash” economy in the construction industry. As taxpayers, we should all be outraged by the fact that millions upon millions of dollars in taxes, EI and CPP contributions, WorkSafe BC premiums and wages go unreported in the construction industry, while the rest of us pay our fair share of taxes. Thanks again to Gordon Campbell and the Liberals bowing to the wishes of their “Big Money Contributors”, a highly efficient team of investigators, charged with uncovering these violations, was disbanded allowing a free-for-all for cheating contractors. We’re not talking about the friend who paints your kitchen or patches a hole in your drywall. We’re speaking about major residential and commercial projects where the entire job was being constructed with cash payments “under the table”, in many cases to illegal immigrants. Each one of the issues we have identified above have a profound effect on our economy, our members, our contractors our District Council and to our training facility. When we get opportunities such as these to speak with politicians of every political stripe we will always strive to educate those in power to look for better ways to address our collective concerns as well as the interests of all British Columbians. 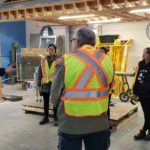 The Squamish Nation Trades Training Centre, in partnership with The Finishing Trades Institute of BC, recently completed a two week introduction to construction program at our facility. 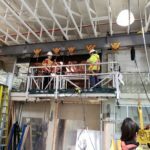 Normally this would be just another story on trades training however, this program had a bit of a different twist. This class was made up entirely of First Nations women who had all expressed an interest in trying their hand at the construction trades. According to our Instructors, these were some of the most enthusiastic hands they had ever had the pleasure to teach. 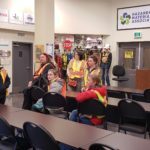 The women were part of a cohort of individuals who had enrolled in a program that would allow them to try a trade for a week at a time at various union training facilities around the Lower Mainland. Two of these weeks were spent at the FTI, where they were exposed to the Wall & Ceiling trades of Drywall Finishing and Wall & Ceiling Installation as well as the Glazing trade. All three of our Instructors involved in the program remarked on the positive attitudes and willingness to work as a team displayed by the entire group. Although one week may seem like a short amount of time to gain an appreciation for a particular trade, our Instructors managed to come up with some dynamic projects that grabbed the attention of these students while giving them a basic understanding of the craft. 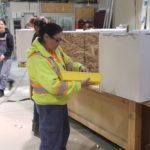 We are hoping that this will be the first of many such programs we run in concert with the Squamish Nation Trades Training Centre and are hopeful that some of the women in this class choose one of our Finishing Trades as a possible career. We’d like to extend our thanks to Peter Baker and his staff from the Squamish Nation Trades Training Centre, for allowing our facility to participate in this ground breaking project. 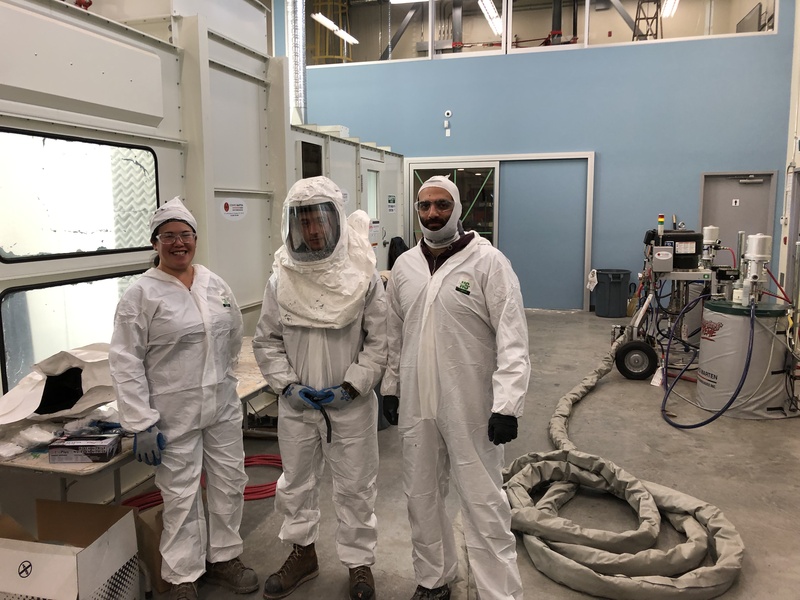 In our final painting class of 2018, our new industrial facility and equipment was put to good use by several of our students who were preparing to write their final exams in preparation for their ascension to Red Seal journey person status . 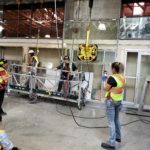 Early in 2018 we were granted final approval by the City of Surrey to operate our facility at full capacity and since that time, we have taken every opportunity to run as many apprenticeship training courses, journey person upgrading sessions and certification programs as possible. 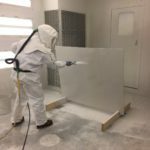 However, one item that is often overlooked is the cost of the specialized coatings involved in running these programs. We have literally saved thousands of dollars this year, thanks to the generous support of our paint sponsor, Sherwin Williams. 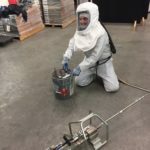 Because of the foresight of this company and their management group, we were able to reinvest those savings into additional equipment and other disposables allowing us to expose a greater number of individuals to a rewarding career in the painting industry. We would like to take this opportunity to gratefully acknowledge Sherwin Williams and to thank them for their generous support with regard to all of the painting programs we operate at our facility. Their investment in our students allows us to create a pathway toward developing many rewarding careers as we train tomorrows workforce today. Are you an apprentice or a tradesperson? If so, find out how financial incentives could help you. Your story ideas are welcome! Please contact the Red Seal Secretariat if you have a story to suggest. If you need more information pertaining to the Red Seal Program, please visit the Red Seal website, call 1-877-599-6933 or email us. The iFTI have partnered with MindPlay Virtual Reading Coach® (MVRC) to assist you in overcoming reading struggles in the privacy of your own home. MindPlay is a web-based reading program using artificial intelligence to deliver one-to-one, personalized, systematic, reading instruction. MindPlay features virtual reading teachers who will help you or your child fill in the skill gaps that prevent from reading accurately and fluently. The adaptive program modifies instruction to suit the needs of each user. Reminder: Only request for users who will complete this course as there are limited licenses. First come, first served. If you already have your login details, go to the LMS homepage and find the MindPlay link. 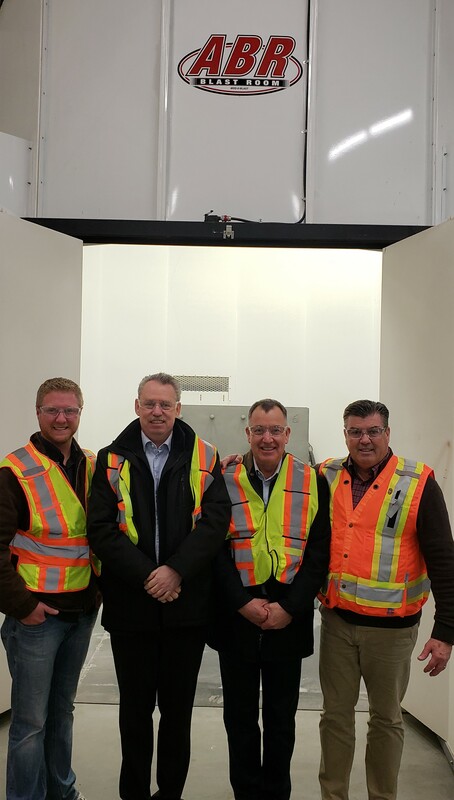 On Thursday November 22 Steve Corban and Ron Harry of LNG Canada took some time to check out the FTI of BC and the apprenticeship programs we deliver here. By now, just about everyone has heard about the $40 billion dollar natural gas plant that LNG Canada is developing in Northern BC. This will be the single largest construction project ever undertaken in the history of the province. 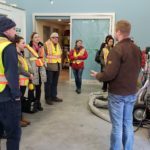 As part of their due diligence, LNG Canada has begun touring many of the BC Building Trades Union’s training facilities in order to gauge their readiness to help develop the necessary number of qualified tradespeople that will be required for a project of such a massive scope. Based on the feedback we received from both Corban and Harry, they have every confidence that we have what it takes to deliver the goods. The two LNG Canada representatives took the time to tour through the entire FTI training facility and see the four apprenticeship programs we deliver here however, their main focus was on the brand new state-of-the-art Industrial Painting building and the highly specialized equipment it contains. 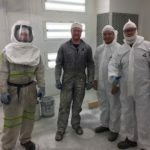 Part time Industrial Instructor and full time DC 38 Painting Representative, Justin Chapman, accompanied the pair through the Industrial Painting section of the tour and was able to answer some of the more technical inquiries our guests had. At the end of the tour Corban remarked that we should all be very proud of our facility and the great work we do here. It’s always gratifying touring individuals through our facility when it’s their first time. They really don’t know what to expect when they enter but by the end of the tour everyone expresses their appreciation for what we do and the quality of our facility and the enthusiasm of our instructors. We say bring on LNG because we are ready! 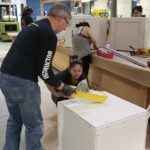 On Monday of this week we welcomed Kyle Kozak, the Carpentry Program Manager for The Open Door Group, and a group of bright young women who are looking for a career in the construction trades, to the FTI of BC. 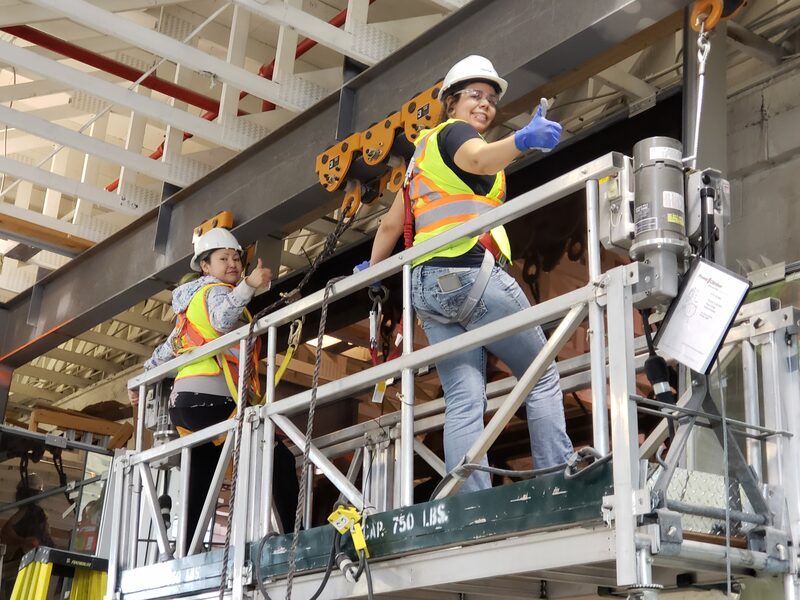 These women are all part of a cohort of individuals who are undergoing a ten week “Women In The Trades” introductory program, specifically geared towards introducing women to the construction trades. 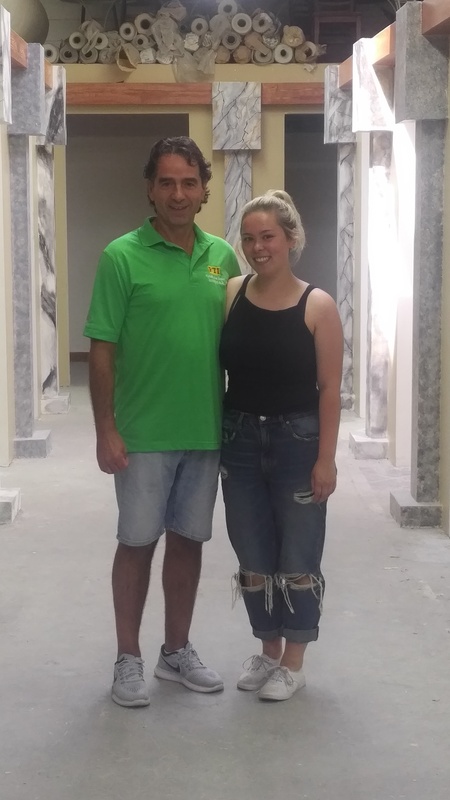 Director of Training for the FTI, Paddy Byrne, had been in discussions with Kozak since early summer with regard to looking at opportunities for his WITT group to explore what was involved in an apprenticeship through the four finishing trades programs we instruct at our facility. Based on the feedback we received from the group, a career in the finishing trades was a very attractive option. Given the fact that DC 38 contractors are going through a period of high employment and everyone of them is looking for the right individual to hire, the timing couldn’t have been better for the Open Door Group and the WITT program participants to come through our doors. After the visit, some of the women who expressed an interest in our programs asked Kozak to follow up with us and see who they would need to contact to start a career in the finishing trades. We have now provided everyone who was on the tour with the contact information of all of our business representatives for each of the specific trades. We look forward to some of the women in the WITT program launching a career with one of our contractors. 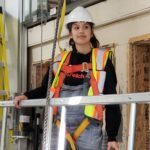 With only a small percentage of women choosing to work in the construction trades, the FTI of BC is looking to do our part in showing more women the rewards that come with working in construction, and in particular, the finishing trades. 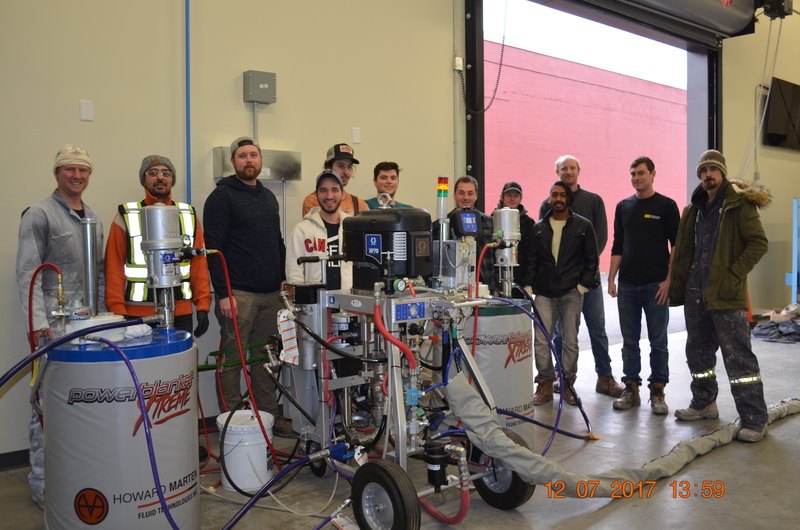 The Finishing Trades Institute of BC has just shared an important milestone with one of our recent graduates. 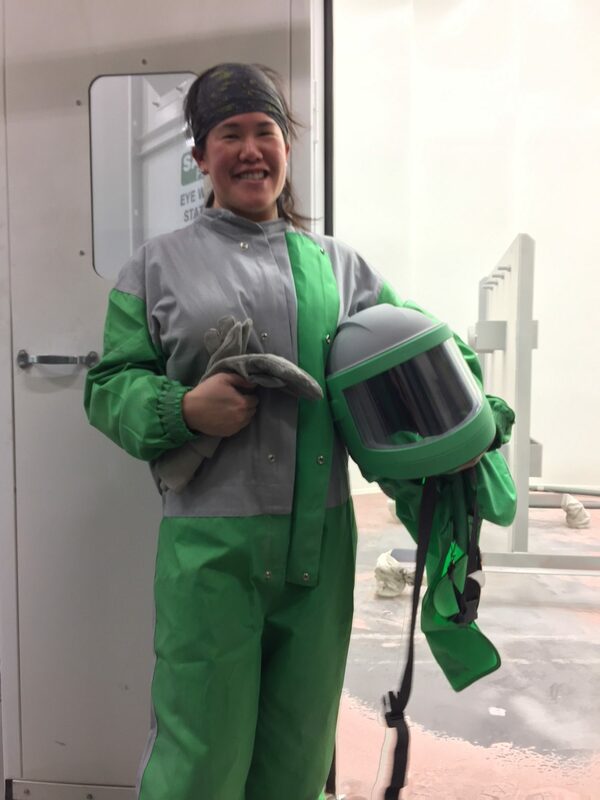 Jillian Steeves, became our first ever (ACE-IT) student to receive all of her in-school apprenticeship training and complete the Red Seal, Painter Decorator program with the FTI of BC. The fact that our first ever (ACE-IT) student to complete this feat is a woman, makes this an even more rewarding accomplishment. 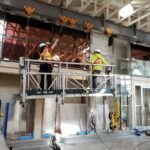 For years now, we in the building trades have recognized that our traditional sources of recruitment are falling short when it comes to replacing our ageing skilled workforce. This is why when the (ACE-IT) program came along we were all in when it came to making this program a success. The Youth Train In Trades (ACE IT) program is an Industry Training Authority (ITA) youth initiative that provides support for students to acquire training that leads to certification as a journeyman, while they are enrolled in high school. Jillian was actually writing her high school final exams and making plans for Grad, the week she started her apprenticeship training at the FTI. Thanks to the encouragement of a dedicated and proactive high school councillor at Frank Hurt Secondary School, located in Surrey, Jillian found her way into the (ACE-IT) program. Jillian told us that she had always had an interest in interior design and the use of colours so the painting program just felt like a natural fit. And fit in she has! 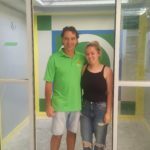 After completing her first level of training, Jillian set out to land her first job as a painter. Warline Painting Limited, had a sharp-eyed HR person, who also just happens to be a woman, who immediately spotted the potential in Jillian and offered her a career with their company. Jillian can’t say enough good things about her employer and the support she has received throughout her apprenticeship. 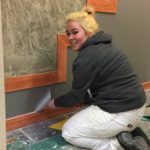 In addition to allowing her the flexibility in her schedule to allow her to attend apprenticeship training, Warline Painting, also paid her full tuition. In return, Warline Painting now has a Red Seal Journeyperson, who this week is leading a crew of six men working on several “High-End” homes around the Lower Mainland. Not too shabby when you consider that Jillian is only 21 years old. When we asked Jillian what it was like leading an all male crew she told us that she couldn’t be happier with the way she has been accepted. In fact, she told us, her co-workers appreciate the fact that she was prepared to shoulder the responsibility of being the lead person and relieve them of the stress that goes with that job. However, some of Jillian’s highest praise goes to the FTI of BC and specifically her instructor, Chico Albino. Chico taught Jillian through all three levels of her schooling and speaks glowingly of her work ethic, her attention to detail and her maturity for such a young person. Jillian appreciated Chico’s patience and how he allowed her to learn from the mistakes she made and to not allow those mistakes to impede her goal of completing the program and earning her Red Seal. Chico allowed her to work and learn in and environment where the stresses were minimized and the successes were emphasised. When we asked Jillian what was the greatest satisfaction she took from her experience here at the FTI and what advice she would give to other young people, she didn’t hesitate in giving us an answer. “Start out with the goal of finishing what you’ve started”. That is exactly what she accomplished when she successfully wrote and passed the Red Seal exam. Pretty good advice from a very impressive young woman.